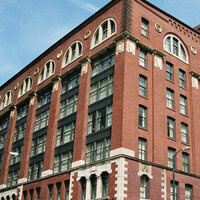 Columbia's premier residence center, Plymouth Court, houses the main offices of Residence Life and approximately 350 Columbia College Chicago students. Students who live in 731 S. Plymouth reside in apartment style units (averaging 1,200 sq. ft.) with four to six students per unit in double-occupancy bedrooms. Each apartment has a full kitchen and full bath, plus a spacious living and dining area. High ceilings and immense windows with views of the surrounding cityscape combine to create the "loft" feel of these appealingly urban living spaces. It was informative, it really helped me figure out where the buildings were on campus, Sky did a really good job of expaining things and she was really helpful and informative. The orientation leaders were very helpful!